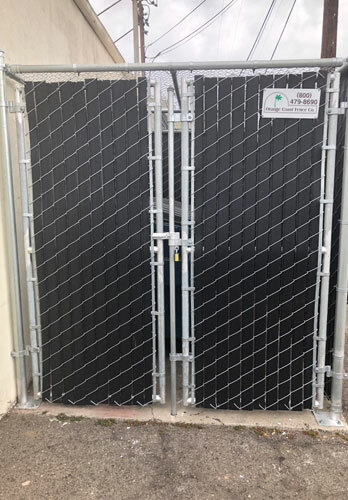 We installed this custom-built chain link gate in Huntington Beach for a client who need long-lasting, durable storage spaces. It features privacy slats for added security, which come in a wide variety of color options to complement your fence's surroundings. 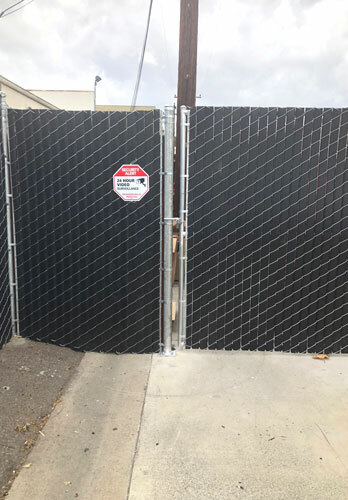 Orange Coast Fence installed this 6' chain link fence for an Orange County business. It features three strands of barbed wire which have been installed at a 45° angle for enhanced security. 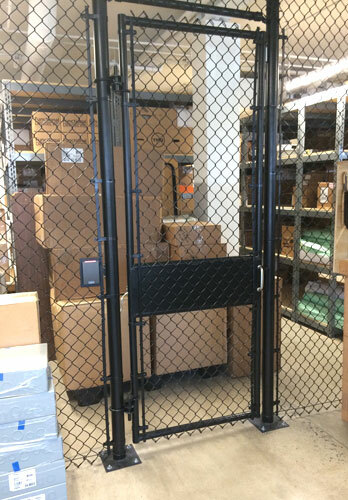 We installed this custom-designed 10' tall black vinyl-coated chain link gate in Orange at an industrial warehouse. Our high quality chain link fences and gates can be designed for a wide variety of industrial, commercial, and residential applications. 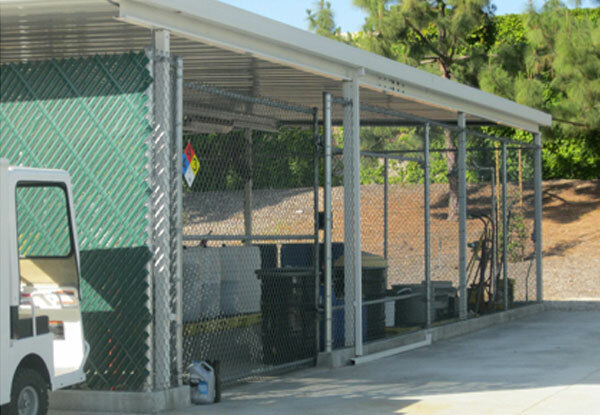 This chain link equipment enclosure in Tustin was installed to protect appliances at the back of a new restaurant. 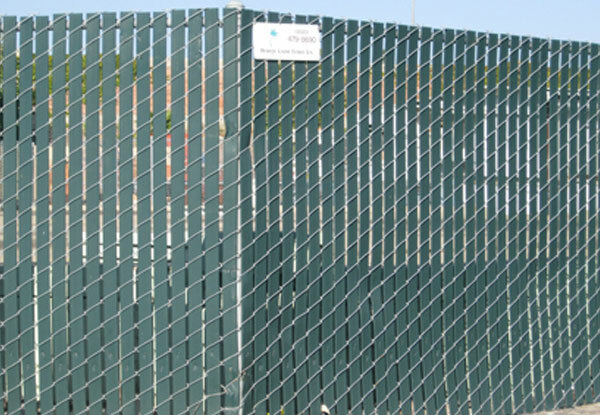 Our professional-grade, galvanized chain link fence materials are extremely durable, long lasting, and rust resistant. 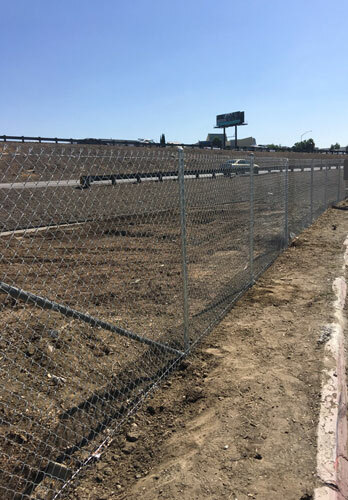 This 6 ft. high chain link fence in Rowland Heights was installed along the 60 freeway to create a sturdy and durable perimeter. All of our fence and gate installations are built using the industry's best practices, and comply with city and county building codes. 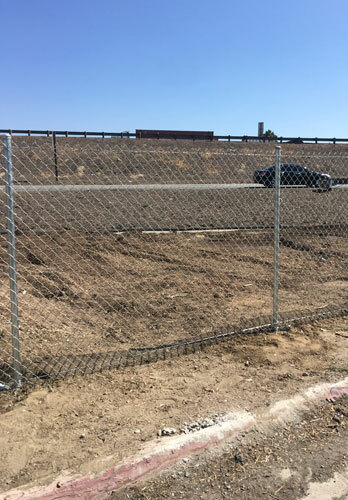 Our experienced team installed this 6 ft. chain link security fence in Costa Mesa. It features barbed wire and durable vinyl privacy slats, which come in a wide range of attractive colors, including black, gray, green, white, rustic brown, and more. We installed this custom-designed chain link fence in Costa Mesa. It was constructed with three strands of vertical barbed wire and green privacy slats for an aesthetically pleasing look. 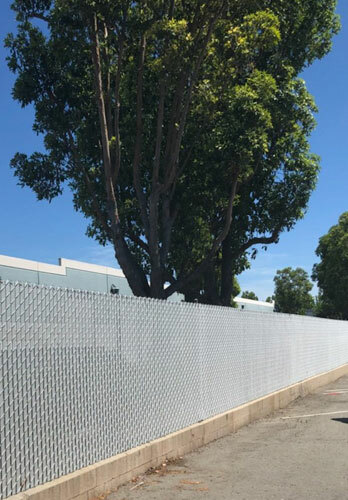 This 6 ft. tall chain link fence in Los Angeles was designed and installed by our experienced team. All of our chain link fences are made with durable, long lasting, and rust resistant galvanized steel, and are built to withstand harsh outdoor elements. 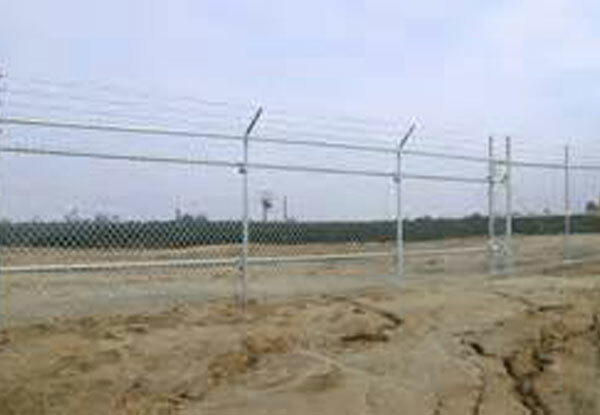 Orange Coast Fence Co. installed this perimeter chain link fence in Walnut. 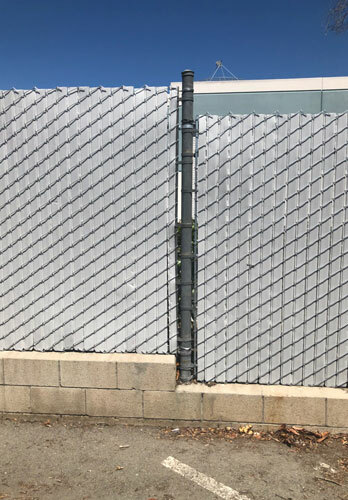 We specialize in custom chain link fences for all of Orange County, including Anaheim, Costa Mesa, Irvine, Tustin, and Yorba Linda. This 6 ft. tall, double driveway chain link gate in Tustin is customized with black privacy slats for added security. 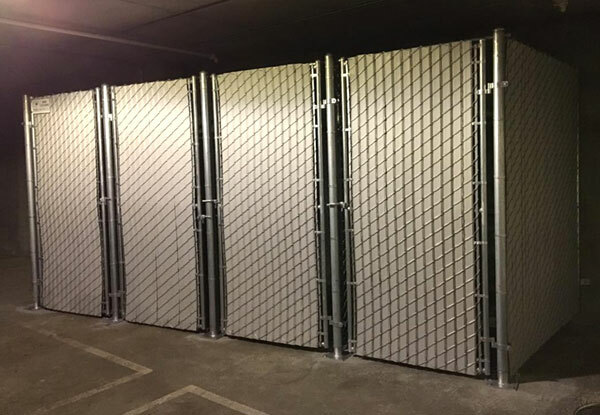 Our high quality galvanized steel gates are ideal for security fencing, warehouses, equipment enclosures, residential yards, and perimeter fencing throughout Orange County. We installed this 7 ft. tall chain link double driveway gate at a Tustin commercial property. It was customized with black vinyl privacy slats for enhanced security. 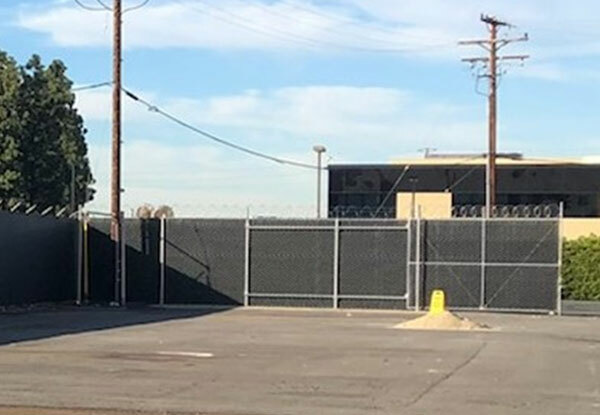 Our experienced team installed this 6' high chain link privacy fence for a Los Alamitos industrial facility. The gray privacy slats blend in with the fence for extra security and an aesthetically pleasing look. This green, vinyl-coated chain link security cage in Corona Del Mar was designed to blend in with the environment. It was constructed from long-lasting, rust-resistant, galvanized steel and features heavy-duty hardware for enhanced security. Orange Coast Fence Co. installed this gray privacy chain link fence in Los Alamitos. 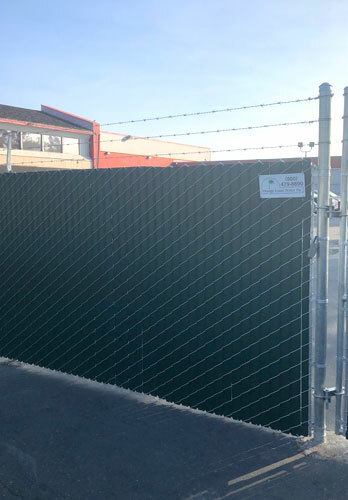 All of our chain link fences are constructed with professional-grade chain link fabric and hardware, and built according to the industry's highest standards. 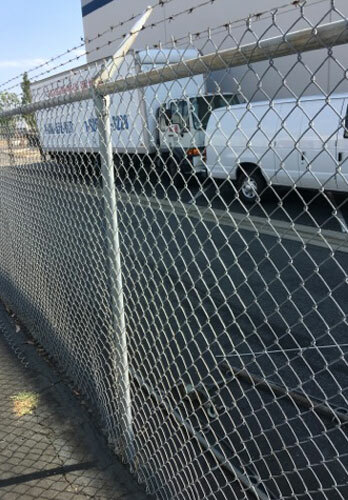 We installed this chain link fence in Anaheim to provide maximum security for a commercial property. To meet our client's privacy and security needs, we added three strands of barbed wire and coiled razor ribbon, as well as a durable windscreen. 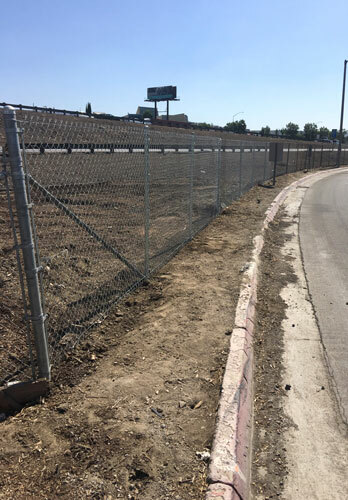 This chain link fence installation was completed in Anaheim. 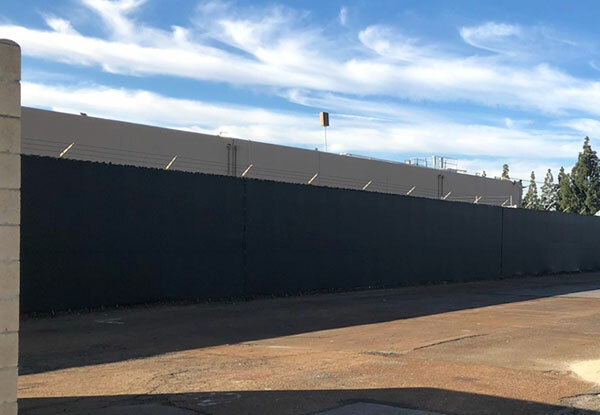 The commercial chain link fencing features a vinyl windscreen for increased privacy, and barbed razor wire along the top rail for extra security. 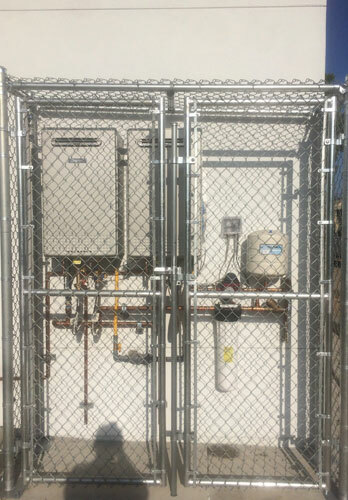 We custom built this chain link enclosure in Huntington Beach to function as storage units for our client. 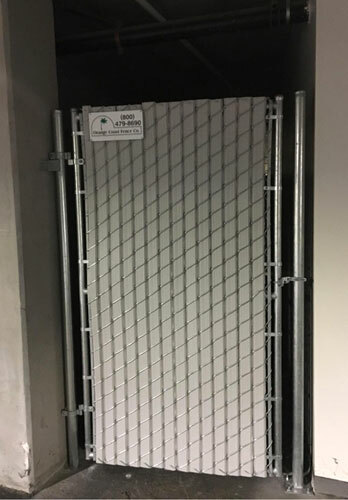 We floor-plated the chain link fence enclosure to the existing concrete floor and added privacy slats for an additional level of security. 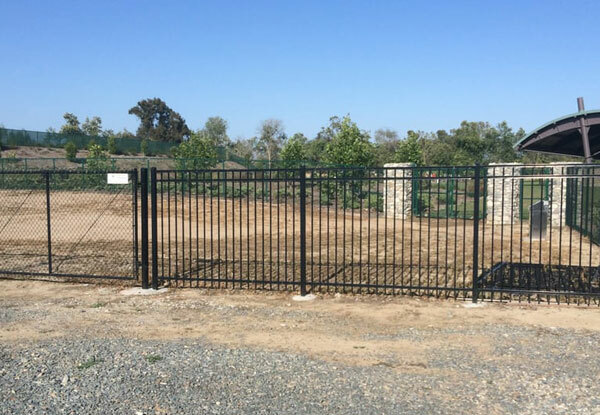 Our team installed this 8' tall chain link fence in Orange. For added security, the fence was customized with privacy slats, three strands of barbed wire, and ringed razor ribbon. 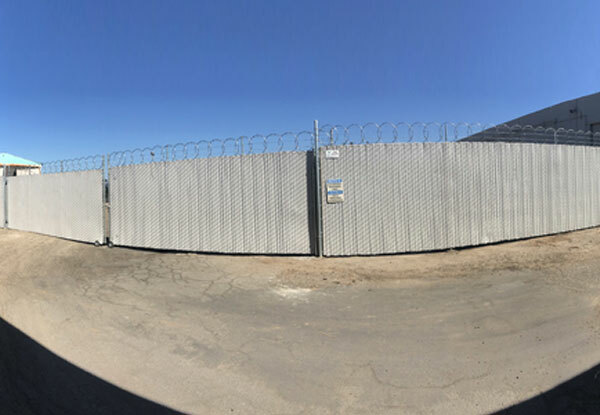 This 8 ft. tall chain link fence in Huntington Beach was installed by our talented team.It was designed and constructed with green privacy slats and professional-grade galvanized steel chain link materials. Our fence experts completed this chain link fence installation in Corona Del Mar. 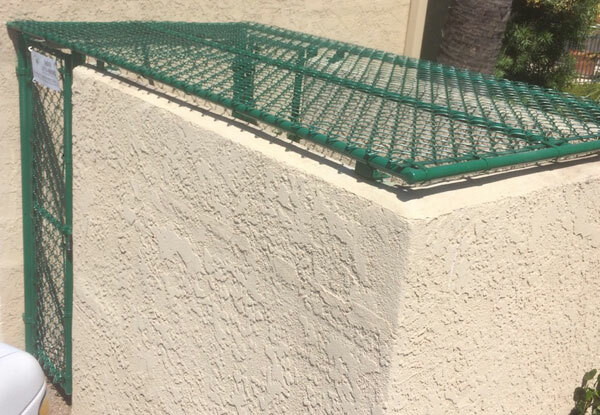 It was constructed out of high grade vinyl-coated chain link in an attractive green color, and was designed with a custom framework that fits the exact shape of the trash enclosure. Orange Coast Fence Company's fencing experts installed this combination chain link and iron fence in Fountain Valley. It was custom-designed with black vinyl chain link materials and powder coated tube steel in our popular Aristocrat style. 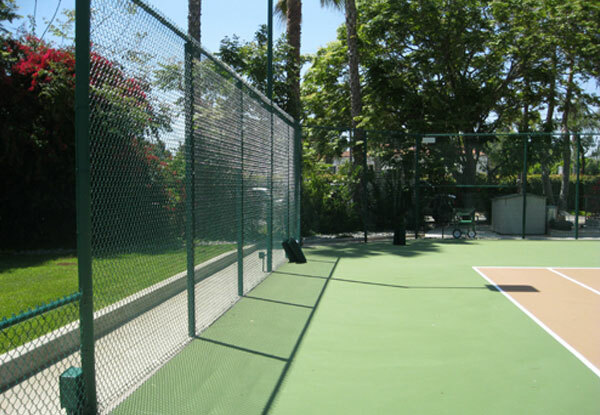 This green, vinyl-coated chain link fence in Yorba Linda was designed to complement this outdoor tennis court. 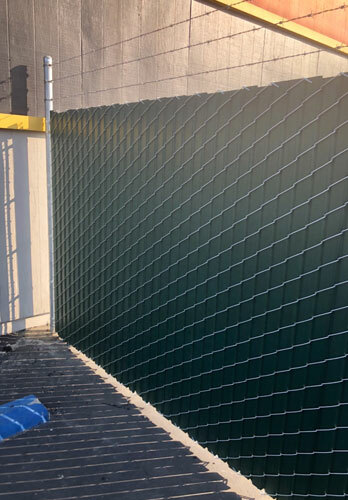 We offer both 9-gauge and 11-gauge chain link fencing to suit a variety of commercial, industrial, and residential applications. 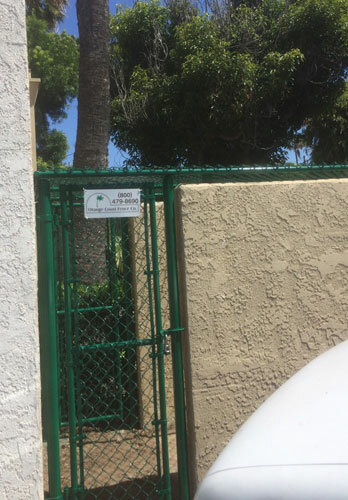 Our expert staff installed this chain ink perimeter fence in Laguna Beach. It stands six feet tall and features three strands of barbed wire and a secure roll gate. We sell galvanized and vinyl coated chain link fabric rolls, steel posts, fittings, post hinges, razor ribbon, and more.